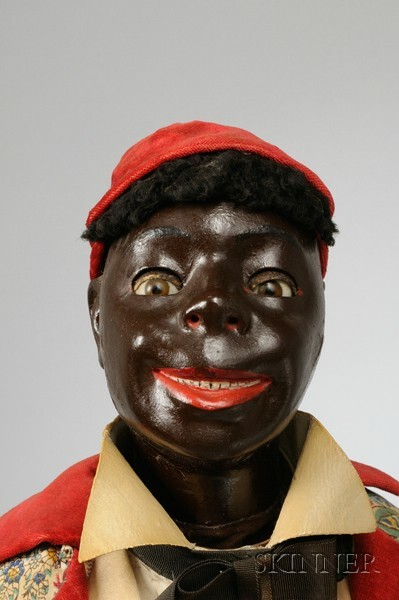 Rare Automaton of a Black Footman with Gong by Adolf Müller, with character head, upturned nose, wide grin, articulated glass eyes and leather eyelids, standing at jaunty angle and holding a large brass gong suspended from a string in his left hand, a kid-covered hammer in his right, articulated at the elbow and wrist, on tapering oak base containing long-duration going-barrel movement with five cams causing the figure to roll his eyes as he beats the gong eight times, then pauses, looking up and down and from side to side before resuming, in the original well-preserved velvet-lined polychrome pattered silk tailcoat over striped waistcoat with brass buttons, wing collar, bow tie, knee-length blue satin breeches, red silk stockings, black buckled leather shoes, and red velvet cap, ht. 34 in., with key stamped A. Steuart. Note: Müller's work is often associated with Vichy's. They were contemporaries working in different countries, trying to capture opposing sides of the automata market. A number of Müller's automata are illustrated in Bailly's reprint of the 1898 Holzweissig catalogue, several posed on his characteristic trapezoidal bases. Provenance: Owned by the prominent Forbes family of Regina in the Saskatchewan province of Canada. Originally from Scotland, the family arrived in Regina in 1907, and stayed there until the automaton's last owner, Miss Athol Forbes, died in January 2008 at the age of eighty-seven. A visitor to the family home during the middle years of the 20th century remembers the automaton standing in their large dining room (hence the gong), where Mr. Forbes permitted it to be wound only on special occasions for the amusement of his dinner guests. Crack at mould seam on left cheek. Otherwise overall good original condition.